If you are heading out on the water, whether it’s on vacation or looking for a home closer to the great outdoors, there are a few things you’ll need to get used to. If you are located by flat water, a river, lake, or a beach on a calm day, a kayak isn't that bad of an investment. The best kind — the sit on top kayak. Sit-on-top kayaks are a new spin on the traditional product design. The main difference between the two designs is the fact that on top of the equipment, instead of where the cockpit seat is, where you lower yourself into position, there is just a flat seat. This way, the rider can avoid the hassle of getting in and out of it, leaving just the open top with a few features to keep the rider on. This product is perfect for those looking for a quick in and out escape from their position. 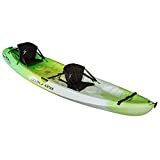 Whether they want to quickly dive in for some scuba diving or need the extra space to throw out a line and fish, the sit on top kayak is a perfect purchase decision for those looking to navigate the waters in sunny climates, warm waters, and with a free spirit. There are several different aspects that can help you understand and guide you to pick the perfect, best sit on top kayak for you. In this guide, we will help direct you to narrow down your choice options and give you what we think is our best. Whether you are a novice or an expert out there on the water, there is a perfect sit on top kayak for you, not only geared towards your skill category but also to your price range. This product was fashioned from a backyard in Malibu, California not too long ago. In 1971, a surfboard was carved in two places to hold the rider and his scuba gear, thus forming the original prototype of the sit-on-top kayak. The best part that everyone loved about the innovation of the traditional canoe was that capsizing was no longer a life-threatening situation, because you, of course, just had to slip off the boat. This was actually a huge deal because there were those who had wanted to try out the sport but were nervous about the confined space and the feeling of being trapped inside one, especially if it capsized. The molded-in depression on the top of the product was perfected from the original cut in a surfboard. Some are made of fiberglass, and some take the cheaper route of being made with plastic. But, in general, the sit-on-top kayaks tend to be much cheaper than the traditional kayaks. They have recreational paddlers, multi-purpose sports, and beginners in mind. If you are still weary on which one to choose, we can help you with the pros and cons of each type of kayak. These kayaks are user-friendly, easy to get in and out of them. If you don't like the feeling of confinement or being capsized, these are for you. They are self-draining, through their "scupper holes”, which solves the dilemma of getting water on top of them and not sinking. You will get wet while paddling. This is not a problem for some, but the sit-inside feature will keep you dryer. This type will shelter your legs and lower body from the water and from the wind. The sit-insides are easy-to-use and normally have footrest large cockpits. Less freedom to go in and out of the water. Of course, it is possible, just a bit more work. They are more susceptible to capsizing or turning over. If you are just heading into finding the first kayak for you, we’ve laid out a few basics to help you on your way. First, find out what type of kayaker you are. If you are looking to battle the whitewater rapids or if you just want surfboard, your product should adhere to whatever goal you have. Then, once you’ve pinpointed the purpose behind your kayak purchase, we move on to the details. 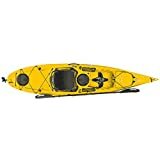 Assuming you are going to pick a sit-on-top kayak to follow along on this guide, you should then gauge which size is perfect for you. Long kayaks are easier to paddle, they have more stability on the water which can eliminate the chance of flipping over, and are built to withstand heavy loads. Short kayaks are lighter and cheaper, making them easy to transport and they have the ability to turn quicker than longer ones. Other components important to the size of the kayak is the width, symmetry, rocker, bottom shape, chines, volume, and the hulls. The width is an important aspect to take into consideration when choosing your kayak because the wider it is, the more stable the kayak is, especially in strong currents. However, even if you think the kayak will hold more storage, it probably won’t make that much of a difference. The wider your kayak is the harder it will be to actually paddle since the hull is wider as well. The symmetry of a kayak can either be symmetrical, meaning that both shapes at the ends of the kayak are the same, or asymmetrical, which can either be fishworm — more volume in the front, or Swedeform —more volume behind. The more symmetrical a kayak is, the easier it will be to turn it, making it better for maneuvering. An asymmetrical kayak is more efficient for speed but can be harder to turn. The rocker is basically the curve from one end to the other of the hull. If you have a rocker that has a lot of pivot, which means it turns up much higher away from the water, it will turn easier because it has less of the boat resisting against the water. Those with less pivot are better trackers. Bottom shapes or the bottom of the kayak can either be flat, rounded, or V-shaped. Flat kayaks will be more stable at the forefront but will be more likely to capsize when turning. Rounded bottoms have more stability when there is lean in the kayak, but initially have less stability than the flat planing hulls. The v-shaped bottoms are great for directional control, but when the boat is moving in a general motion, has less stability than the other two. The chines of a kayak are the corners basically met between the floor of your kayak and the walls. They can range from a direct right-angle, called a hard chine, to a rounded curve, called a soft chine. These can affect whether your kayak will be more susceptible to rolling or flipping over. The volume of your kayak is as simply stated, the total amount of space inside the boat. 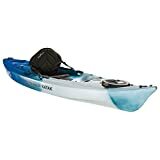 If you can imagine, which we hope never happens to you, that the kayak is completely filled with water, then the inside of the kayak would be measured in liters or gallons, depending on your location or where you purchase it from. Hulls can either have flat bottoms, hard chines, and a greater flare or they can have round bottoms, soft chines, and less flare. The hulls can also be lightweight and skinny shaped with a narrow V. Depending on the shape of your kayak, each size and shape has a benefit that comes along with it, and also negative aspects. Before you choose which sit-on-top kayak is for you, judge what kind of style you need. Once you’ve got that down, then you can move on to price range, one-seater/two-seater options, and color. This top of the line product is not only great for its price, it also has an unmatched quality that can make the perfect purchase. The design is compatible with rough surf, ocean waters, flat and calm streams or rivers, and for grazing over ponds and lakes. Not only does this product have a built-in carve to its seat like most sit-on-top kayaks do, it also has the option to add a seat to be more comfortable and has more support during your journey. The one includes side, bow, stern handles, a hatch and bungee-covered tank wells for your storage, and an ergonomic design that is made for the build of your body. It has a three-year warranty and a 300 lb. maximum capacity. The product is perfect for beginners who might not have a lot of strength. It is lightweight and easy to carry for just one person. This is also really beneficial, when you need to carry it from your vehicle to the water. The tracking is also sufficient and allows for a good speed. Strangely beneficial, as well, for instance, if you want to use it to go fishing, you can sit side saddle (with your legs over the side) and it will still balance your weight, perfectly. Our second best is a bit pricier but still will have amazing results. This one is perfect for those looking to invest a bit more, but have it go a long way. 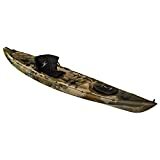 This sit-on-top kayak has a tri-form hull which is perfect for stability on those rough waters, tracking, and maneuverability for those looking to take trickier paths. The 9 ft. long product weighs only 45 lbs., which makes it easy to lift from your car to the lake or beach. The sit-on-top kayak also has a padded and comfortable seat, and also comes with a back to it, so you can put your back problems aside when purchasing the Ocean Kayak. If we haven’t convinced you that this is one of the best, some of the extra features include molded-in side handles, molded-in cup holders, a replaceable rear skid plate for durability and a bow and stern carry handles for easy transportation. It also comes in yellow, orange sunrise, and envy green. The design is incomparable and perfect for any gender, age or preference. The neat thing about the products from this brand is that each of their kayaks can actually sack right onto each other easily, which makes it perfect for storage. They are also small enough in height and width to fit right underneath the underbay of an RV. 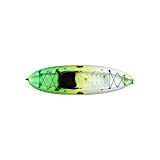 This product has been proven to hold solid in the water, minimizing tipping capabilities and even coming from someone with a lot of experience with a variety of kayaks, the product holds its own and has become a fan favorite. This inflatable product has only a 5-minute setup time which makes it easy to transport, lightweight, and effective. On this sit-on-top kayak, there is a seat, which can be easily carried like a backpack. On the product, there is a backrest, a multi-position footrest, a storage area to securely place your extra items and tie them down with bungees, a cup holder, carry handles for transportation and comes with a hand pump and paddle. The Sevylor Quikpak is guaranteed with a 90-day warranty and includes a hand pump and paddle. The 8-ft long kayak is perfect for those on a budget looking to still have a good time and not downgraded on quality. 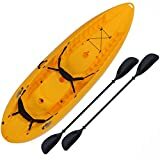 This stable product is an inflatable kayak that is not only simple to inflate, it also does the job just like a rigid one. Even when you are taking it though waves and breakers, the product paddles and tracks extremely well, being able to turn on a dime and do what you want with it as you will. Another great feature is how easy it is to carry. 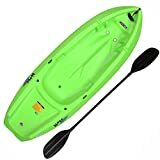 Just pushing the paddle under the triangle bungee tree on the bow, and hooking the back of the paddle under the seat straps, makes a perfect carrying rod for you to lift and commute it in and out out of the water to you vehicle. It is light enough to do with just one hand. It also stands out among the crowd, having great tracking and stability features. Perfect for beginners and advanced, and everyone in between. The Ocean Kayak is a fantastic choice for surfing because of its adjustable foot braces which lets you change your footing and paddling position as quick as possible with ease. This helps when you are trying to ride the waves and gives you great maneuverability. The comfortable seat features with the extra padding both located on the bottom and on the back is also really helpful when you are being whipped about on a wave to ensure optimal lumbar support. When you‘re riding on the wave, you also want to be sure that your extra storage is safe and dry. 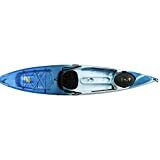 The Ocean Kayak Tetra is perfect when surfing because it comes with a large tank well that secures your extra equipment with a bungee and a seal hatch covers the entire thing to keep all your items dry and secure. For an added bonus, this comes with a paddle keeper which holds your paddle, when you are tired from surfing, you can easily give your arms a break in between waves, or when you‘re waiting for the next set to come in. The Lifetime On-Top-Kayak is a perfect choice for your kids. With this product, there is no more jealous looks and desperately searching for adjustability when it comes to looking for a way or features made to have your children join in the family fun. This design is specifically tailored to suit children, from their size to their weight to their skill level. It is made with your kids in mind which will make you happy and has a weight capacity of 130 lbs., which means they will know that it is just solely for them. It is for children ages 5 and up, weighing in at only 18 lbs. so it‘s easy for transportation, and even includes molded finger handles for tiny to large fingers to carry. The build actually includes a slope at the end built so that kids can use the swim-up step to get on the kayak from the water. It not only boasts durability which means it will last for at least five years, but it has multiple footrest positions for different size riders, or one rider as he or she grows. It is a great make for tracking and surfing. This big angler is made perfect for those with a bigger build. Whether you are looking to get out and exercise or if you exercise way too much, this product is made to not only hold you steady, but also let you move happily about over the water. It holds one person, and is 11.5 feet in length, giving you enough leg room to stretch out. It‘s extremely sturdy, which gives off the impression of capability, weighing in at 70 pounds. Another great feature is that it is great for fishing. The product comes with three rod holders, two of them as flush-mounts and the other as an adjustable. The entire thing is so sturdy, stable, and durable that riders can even fish standing up. 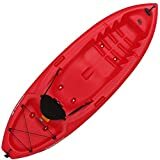 There are also multiple storage areas, all three of them waterproof, and has rudder control with foot pedal operation, no matter the condition of the water. If you are looking to save money by buying one product for two people or looking for family friendly choices, the 12-foot Malibu Two Tandem Sit-On-Top Recreational product is perfect. You can ride with you and another adult, or even two adults plus one child. The maximum capacity is 375-425 lbs., which means that it‘s built perfectly for the entire family. Safety is not a problem, either, the product can not only hold three people, it actually has three different seating positions located on the bow, stern, and the middle. You don‘t have to ride with others, as well. It also has seating for a solo rider. It comes with two comfort plus seats, gear straps, three molded seats, side carrying handles, and overlapping foot wells. The product has the capabilities of stacking with others, and has an adjustable leg placement, so it doesn‘t matter how short or tall you are. The original sit-on-top specifically designed for fishing has the name to back up its perfect productivity: The Prowler. Designed to meet all your needs while out on the water fishing, this product is our number one pick for purchasing a tool to use when out on the water fishing. Perfect for a warm day, you can easily get in and out of the water to cool off (just don‘t disturb the fish), and get right back to fishing. It is the most popular designs, especially for fishing. Its performance hull is also extremely fast, which means that it is great for tracking. Other features that make it perfect for fishing is that it is quite and stable. So when you are looking for the fish and don‘t wish to disturb them or scare them away, this is a perfect ride to have. It is also capable of tracking and gliding smoothly in either calm or rough waters. The storage feature is also great for fishing. It has a large front hatch that has absolutely easy access to either storages in the bow or the stern, which fits multiple rods for safe, below the deck storage. The seat is extremely comfortable, perfect for those long hours of fishing, whether you are strapped in the seat or sitting side saddle. 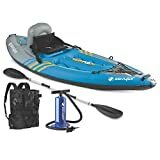 Some extra special features also include two rod holders, a 6-inch hatch with storage bucket, two cup holders for your beverages, two paddle keeps, its transducer compatible, and has a skid plate. Another fun feature is that the rear storage also has an oversized tank which is well designed that can accomodate and fit coolers, crates for fishes and tools, tackle boxes, bait wells, and if you are really serious, it can fit scuba tanks. You can‘t find a better fishing choice anywhere. Made perfectly for portability, this product holds one person and only weighs 46 lbs. It is nine feet long and has a deluxe kayak seat. This means that it is stable and portable. Made to move, there are two paddle parks which secures the paddles, which makes it easy for transportation, along with the four easy-grip carry handles. Although it is heavy, since there are so many handles, it gives the opportunity for multiple users to help transport the product from the car to the water, and back again after the day is done. If you want a UV-protected product then go for the Emotion 90244 Spitfire. Offering you extra storage, it also has a couple of adjustable foot braces and it is suitable for blue water use. With side pockets for additional storage, the seating area is large and comfortable. You will be able to fish along the coast just fine with this. The clear plastic is thick and it has a great dry storage compartment for your needs. With great maneuverability, it offers a ton of support. What’s more, the rear skid plate is replaceable. It keeps you dry and comfortable and it has freedom foot wells for additional comfort. Many people have used this in surf and its durability is outstanding. It is also known for stability and tracking and it can accommodate kids and adults alike. The rear tank well is properly made and the boat is quite lightweight as it weighs 41 pounds. With the ST performance hull, the boat is quite stable and is great for the children. Ideal for longer paddles due to the size, there is also some cargo net lacing on this for safety. There is no problem with stretching out as it has a lot of room and volume.It can be easily mounted onto any car roof. For women, the Ocean Venus 11 is a great product to consider. You can even mount or store this conveniently onto any pick-up truck and lift it with its side handles. It also comes with a ready cup holder for your drinks and is also compatible with scupper plugs. The boat has 1 swivel rod holder and it is great for fishing in the sea or in a lake. With a portable accessory carrier, you can mount a trolling motor onto this boat or even use the tow rig on this. Made of sturdy polyethylene material, it also comes with a skid plate and tracks well in a straight line. The boat has a width of 28.5 inches and it has a low deck profile which is meant for women. It has a unique grab handle system and is tailored for the female center of gravity in its design. You can put your personal belongings in the compartments of this product. With shock cord straps, it has a stable seating system and has a forward cargo area to keep your items. It is quite easy to transport and has molded front handles for easy carrying. Built with a tunnel hull, it also comes with rear carry handles which make it easy to carry. Its hybrid seat back is comfortable. The cam lock hatch measures 6 inches and it has enough room for your lunch and drinks. With a weight capacity of 275 lbs, it features stern deck rigging and its storage pockets are mesh covered.The twist and stow rudder is quite useful and the polyethylene material is sturdy. The BIC Sport Tri Hull Borneo comes with movable wheels. Also equipped with rod holders, the this is ideal for fishing and the like. Made of high density polyethylene, it measures 13 feet in length. It has a cup holder and the scupper plug holes are self-bailing. It is built with superior strength for those people who want to just float around a lake or the ocean. With its storage bucket, it has a couple of bow and center hatches and a paddle keeper for your convenience. It has great comfort and stability and a flat back rest for an ergonomic seating all the time. The high performance hull design and triple-volume design makes this strong and easily stored when not in use. The twin sheet technology and the tri hull design make it easy to paddle. Designed for kayaking in the ocean, the carry handles of this are on the front, rear and side for convenience of handling. It has extra volume and added comfort for those who like to go birdwatching or fishing. It can survive minor wakes and handles rough water well. You can even mount the it onto j-bars and has secure foot bracing. With a stern tank well, the seat cushioning is comfortable, well made and well finished. There is a mast receiver receptacle in case you want to put up a sail so it is good for sailing as well. Another that we found was best overall, was the Lifetime 10 Foot Manta Tandem. This product has many features that are perfect for just about anybody. For example, it can hold one or two people, being used a single or tandem, with a 500 lb. weight capacity. It could possibly even hold three people, if one sits in the middle because of its weight limit allowance. Both seats have two soft backrests and the product comes with two double sided paddles, perfect for synchronized paddling. The best part? The entire thing weighs 60 lbs., easy for two people to carry, especially with front and rear carrying handles but possible for one person to transport from their base to the water. The Manta Tandem has a tunnel hull design, which provides ultra stability and tracking. It boasts that it is almost impossible to turnover, especially because of its "high and dry” seating. This means that riders will never be on the floor, where water might get to. The entire product has a five year warranty with a forward cargo area. Yes, absolutely. If you don‘t want to get wet, go with sit-insides, or stay pretty far away from water sports. With a sit-on-top, it is nearly impossible to not get wet when paddling. With sit-inside kayaks, the chance is slimmer, but if you are paddling on a hot day, you will probably welcome it. What are the scupper plugs for? As mentioned above in the guide, these holes help drain the water out while you are using it. The plugs are simply used to plug up these holes when you are on flat water and it is less likely that you will not be having water splashed into your kayak. These plugs add weight capacity and keep the boat dryer. Depending on where you are kayaking, you may want to check before implementing them in your structure. There are several different ways to lay or hang it when putting it in storage. Given it is not inflatable, it should be laying on its edge, upside down, standing on its end or hanging on its edge. If you are looking into investing in a sit-on-top kayak, there are a few things you need to know before you buy. We hope that this guide has helped you on most of the decisions you will need to make on your purchasing journey. After reading this guide, you should be more knowledgeable before making a choice on which sit-on-top kayak is perfect for you. Whether it is based on the type of body of water you’ll be on, your personality, or your skill set, there is a perfect product made just for you. There are even opportunities to cater your purchase solely based on your budget, without sacrificing quality.